On June 28, 2018, there were 16 commercial Chapter 11 cases filed in the USA. The Petitions were filed in CT, IL, LA, TX, NY, AZ, NE, TN, WV, FL, DE, PA, WA and GA. The cases were in the following industries: real estate, restaurant, education, retail, entertainment, financial services and telecommunications. Cost-effective daily, weekly and monthly list options. Sign up for a trial here. On June 27, 2018, there were seven commercial Chapter 11 cases filed in the USA. The Petitions were filed in NJ, OR, TN, MA and CA. The cases were in the following industries: entertainment/recreation, restaurant and consulting. 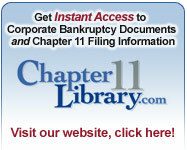 On June 26, 2108, there were 10 commercial Chapter 11 cases filed in the United States. The Petitions were filed in NY, CA, MD, GA, NC, PA and FL. The new cases were in the following industries: real estate, manufacturing, construction, retail and business services. Our cost-effective daily list includes all jurisdictions in the USA. Sign up for a free trial now.